A manual for cross cultural Christians is the more descriptive sub-title of this book. It outlines cross cultural principles, describes their use for Christian ministry, then uses case studies of hands on application from the author's 30 plus years of ministry in Papua New Guinea. 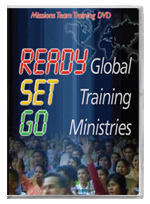 It is a manual for missionaries in service as well as for people preparing themselves for cross cultural ministry. The author is currently director of Global Training Ministries, Australia. Includes a bibliography and index. 298 pages. See the Resources section of this web site for freely downloadable resources you can use to enhance the training experience.